With all eyes focused on the conflict in Libya, the authorities in Bahrain are waging a campaign of fear and intimidation in the tiny Gulf kingdom, aimed at silencing opponents who aid the foreign media. The latest raids started very early in the morning last Friday and continued over the weekend. Members of Bahrain's feared National Security Apparatus (NSA) stormed into the homes of prominent human rights and pro-democracy activists. Among those targeted were people providing photos and videos of police and army brutality to foreign journalists. One e-mailed me with a single word in the subject line: "help". "Dear Mr Bill," wrote Ahmad (not his real name). "The riot police came to my home last night. More than 20 of them searching. But I wasn't there." He was warned by his father not to come home. I contacted the father by e-mail and he sent me further details. "They came early Sunday morning at 0230 on 20 March 2011. We heard them knocking [at] our main bedroom. I was sleeping with my wife and my two daughters on the first floor. They are about 20 to 30 persons and their faces are covered and we can only see their eyes and some of them are carrying guns. "They entered the house from one of the windows. They did not identify themselves, but just kept asking: Where is Ahmad? They searched all the rooms and cupboards and then they asked again for Ahmad and we told them he is outside the house and we do not know his location." Ahmad's father is a businessman who has never been involved in any political activity. He told me he is horrified by what is happening in Bahrain and by the behaviour of the security police. "My son is a human rights defender. He is a very peaceful person and spends all his free time helping people who need help. I have a great deep concern [for] the safety of my son and I have no idea what to do." The young human rights activist is now in hiding and moving from place to place. Another activist e-mailer told of how the family home was attacked and ransacked. "I am being watched. I can't use my car. I can't use my phone. I sleep in different houses every night." 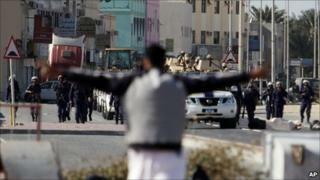 The Bahraini authorities have refused to comment on the allegations. Among those arrested were seven men in the midst of a terror trial who were granted a royal pardon by King Hamad a little over two weeks ago. They were among 23 picked up in August of last year. The men were charged with financing and directing a terror organisation and held for several weeks without access to lawyers and families. During that time, the 23 confessed. It is widely believed the confessions were extracted under torture. It is an allegation the government continues to deny. However independent observers and groups such as Human Rights Watch and Amnesty International say they are deeply concerned about the claims. Families of those arrested in the past few days are terrified that their loved ones will be subjected to torture - especially "falaqa" where victims are trussed up and suspended in the air while being beaten. Many of the 23 seized last August had the telltale signs - deep bruising on wrists and ankles - of falaqa. And those who are on the run do not want to be identified for fear of repercussions on their families. "All my family are worried about the safety of my son and we all worry about ourselves," wrote the father of the young activist. "We pray to God to keep us safe. They did not come last night. But we do not know about tonight." Mobile phones have been disrupted. Social networking outlets are being monitored. Activists with contacts to outside journalists are being arrested. Families are living in terror. Early on Monday morning, another prominent commentator was picked up. He had apparently upset the government with his frequent appearances on Arabic satellite channels in which he detailed attacks by the security forces and documented deaths and injuries. The crackdown on protesters with contacts to international media is happening when the world's attention - and the media - have swung to the crisis in Libya. It is an opportune moment for the Bahraini authorities to try to stop damaging images and stories from getting out. Fear is proving a useful weapon for them.